Engineers are invariably drawn to new technology. It is important to realize, though, that sometimes old ways are the best. This is particularly true when considering whether to use aspheric lenses in an optical design. We at Ross Optical have certainly embraced the recent advances in asphere fabrication, as evidenced by our range of aspheres. With that said, we also stock a huge range of hard-to-find, large-diameter, spherical doublets and triplets. Experience has taught us that conventional spherical optics remain the most viable and cost-effective choice for many optical systems. While it is tempting to treat asphere technology as a cure-all for every optical design challenge, there are three important caveats to remember. Each aspheric surface adds a new variable to the design process. Those new variables are powerful tools, but it is important to recognize that increasing the number of variables makes it harder to find the best design. Furthermore, an aspheric lens that looks good on paper may not be easy to manufacture because of tolerancing challenges. Compared to the well-established terminology used in conventional optical manufacturing, the vocabulary of aspheric design is still evolving. Translating an optical design from “design language” into “manufacturing language” requires great care, and translating dimensional tolerances is particularly difficult. This is problematic because an asphere’s performance is often quite sensitive to small changes in the surface parameters. Even when a manufacturable design is found, it can often cost more than a traditional solution. 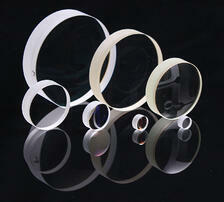 Aspheric lens fabrication is the frontier of optical manufacturing and testing. Being at the cutting edge of any industry costs money. Even an “off-the-shelf” aspherical component will generally cost much more than a similarly performing spherical lens system. Aspheric lenses can be a valuable design asset, from correcting spherical aberration to making systems more compact; however, aspheres also present their own set of challenges. Making an informed decision about whether to incorporate aspheres into your design requires a deep knowledge of optical design and manufacturing. Ross Optical can help you design a system that meets your unique budget and performance requirements. Contact us to talk to one of our design engineers about your project.